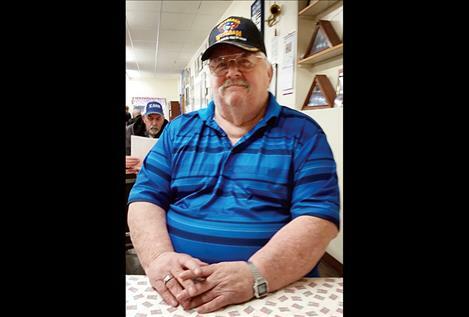 Today in 2017 Ray spends a lot of time on duty at the Ronan VFW, but it didn’t take long to get him remembering back to January 1966, when he was a senior in high school in Arkansas. 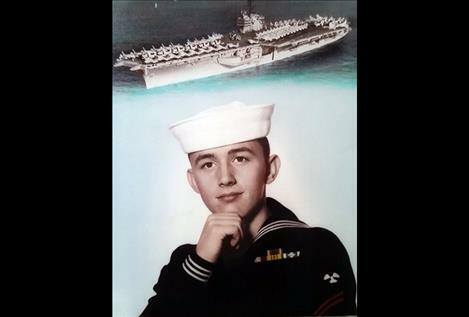 He got a service deferment until after graduation by taking what he calls “Kiddie Cruise Enlistment.” This program put him in at age seventeen and out before his 21st birthday – 3 ½ years in his case, which sounded better than 4 years. Also, if he had waited for the draft he probably would have been in the Army and he didn’t want that. Ray completed ten weeks of boot camp at the San Diego Naval Training Center, California. What did he do there? March! There was also physical training. The “basic” part of basic training was “basically” brainwashing to get the recruits to conform. They were now a unit, not individuals. It was a time to grow up. He was a 17-year-old, on his own for the first time, and then a guy was telling him when to eat, sleep, shave – his whole life seemed to be laid out. On top of that, the ocean humidity in San Diego was different from Arkansas humidity, and Ray got pneumonia. The Naval Station Great Lakes near Chicago, Illinois, was Ray’s first duty station. He wanted to be a machinist’s mate, and at this A-school he learned the basics for mechanics. There was also more humidity. Then in January 1967, Ray was on to his second duty station, where he spent the remainder of his time. It was here at Bremerton, Washington, where he first met the USS Ranger CVA61, in dry dock for repairs. The Ranger was an attack supercarrier, over 1000 feet long and carrying up to 90 aircraft. The ship had huge high-pressure steam accumulators that ran the catapults that launched the planes from the deck. His job was maintenance. After repairs, the ship went to its homeport, Alameda Naval Air Station, California. From there it went to San Diego for sea trials and then to Vietnam. While on the Ranger, Ray made two six-month tours to Vietnam. On the first cruise he was deployed from November 1967 to July 1968. Korea had hijacked the USS Pueblo, a spy ship that Korea said invaded its territorial waters. The Ranger spent 30 days patrolling off the North Korean coast. There were still bad relations with Korea left over from the 1950s and President Johnson didn’t want another war, so the Ranger was pulled back to Vietnam. This really bothered Ray and the other guys because they never wanted to leave anyone behind. The crew was released after 11 months of captivity. The ship was never recovered. After the first tour, the ship sailed again to Bremerton for repairs and then went back to Vietnam for Ray’s second tour. During each six-month tour, the ship was usually at sea for 30 days and then in port for a week. While in port, Ray would often work half days and then have “liberty call,” but as an enlisted serviceman he had to be back on board ship every night. Ray spent shore time in two Japanese cities, in Hong Kong, and in the Philippines. Hong Kong was the best city to visit but also the worst. On one visit Ray had two suits, six shirts, and several ties custom made for under $100. The ship couldn’t dock so small boats took the guys back and forth. The hardest part of Ray’s military service was being away from home, but it was also the best part. He enjoyed meeting different people and he liked the different foods. The different cultures and ways of life were interesting: Japan, and British Hong Kong, and Kowloon with its floating restaurants and floating city of sampans where a person could walk from one to the other for long distances. He had the opportunity to board a British ship and met a rugby crew that he remembers as being pretty fierce looking guys. Ray was sent back to the States in summer 1969 with four months left in his tour of duty. Because of a reduction of forces, he got out 30 days early. Ray didn’t see firsthand the frustration of the ground troops who were handcuffed to the point where they couldn’t win the war, but he agrees that it was no way to fight a war. The Ranger was mothballed in the '90s and finally sent to Texas to be cut up for scrap. There was no offer to “re-up” and Ray wouldn’t have stayed in anyway. If he had or if he’d joined the Reserves, he could have retired at age 37, but he didn’t like being told what to do and didn’t want anything more to do with the military. He’d advise young people interested in the military to join the Navy or the Air Force – you see more of the world and don’t get shot at so much. It would be a good career for some people, but there are too many orders to follow for people like him. Ray says maybe he could have done more if he’d stayed in, but he’s had a good life. Thank you for your service, Ray.